In our case, with radiant floor heating, we do not have an air handler normally used with forced air heat. Code requires some form of ventilation. Heat vented from your home via air leaks, bathroom fans and fresh air sources waste heat. 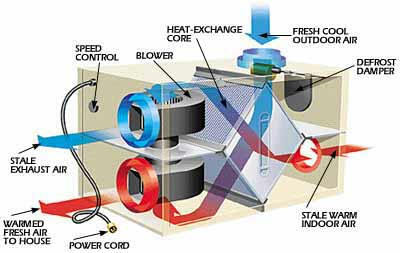 A heat recovery ventilator can exchange air, but recover up to 80% if the heat. The bathrooms have a "turbo switch" to boost the output of the HRV. The HRV also keeps the inside / outside pressure balanced. If the pressure becomes unbalanced (cook top exhaust fans, bathroom fans, etc.) air may enter the home through vents and air leaks, pulling dust and toxins with it. 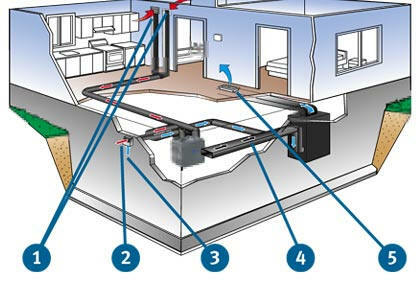 1 Pollutants are drawn in through the air inlet duct located near the ceiling. 2 Stale, polluted air is expelled. 3 Fresh outdoor air enters your home. 4 Fresh outdoor air enters your forced-air system.